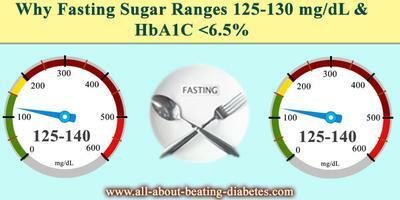 Why Fasting Sugar Ranges 125-130 mg/dL & HbA1C <6.5%? QUESTION: My fasting sugar is 125-130dl/ml and HBAIC is <6.5. How should I reduce my fasting blood sugar level < 100dl/ml. I am regularly doing excercise like 20min running on threadmill followed by 20min strengthening exercise though my fasting sugar level reading 125-130dl/ml. At first, results up to 130mg/dL are considered acceptable blood glucose, but I’m sure that you can bring these results back to the references ranges with some help. So, in purpose to do this, you have to pay some more attention to what you did a night before. I’m telling you this, because the fasting blood glucose concentration generally depends on the amount and the type of food acquired at dinner and the exact time when you have eaten your dinner. 1. First, try to eat at least 4-5 hours before going to bad. I know that this is hard, but you have to do this, because in this way you are giving your body enough time to metabolize the glucose acquired with the food. 2. If you feel hunger during these 4-5 hours, you may eat something very small in purpose to suppress this hunger, like 1 yogurt, glucose free of course, or small salad, made of low-carb products. Make sure to have this small snack at least 2 hours before bed time. 3. Try to do some physical activity before bed time. For example, you can jump at one place for about 20 minutes, in purpose to burn some of the glucose in your blood providing a healthy sleep as well. 4. Next thing, which you have to do, is to take your medications and the herbs regularly, according to the doctor’s prescription. I’m mentioning herbs, because some herbs, like gymenama sylvestre, bitter melon and others are proved to have blood glucose lowering effect. So, put in consideration their usage. Try to manage the stress, especially the bed time stress. Stress leads to elevation of the blood sugar level, so you have to find a way to beat it. If those things mentioned above are not efficient, you have to consult with your doctor about dosage adjustments, because diabetes is a progressive disease after all. As I can see from your fasting blood glucose, it looks fine. I hope you will go on keeping your sugar levels well-controlled like you are doing until now. 1- the first one is done at any laboratory, where the extracted blood (most common venous) is processed to find out the level of A1C. 2- the second and most recent way (newly discovered) is by measuring A1C level at home. In this case you will need to have a special machine called A1C meter. You will need to pickle your finger with respective lancet and pour blood in the strip and then, wait for the machine to give the results. 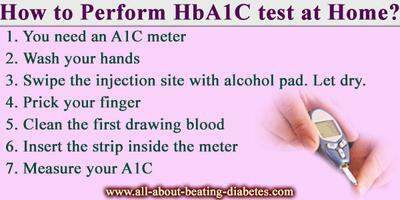 The principle of performing the A1C test at home is the same as measuring blood sugar at home. The most important part is to interpret the results. Your doctor might help you on this; all you need to do is to pass to your doctor the recorded A1C levels. Another important thing is regarding the time when you can perform A1C test at home. Actually, you can perform it anytime, no need for fasting or having a meal as it is needed when you measure blood glucose. However, in this case, you need to perform the A1C test every 3 months. In other words, if you do the test today; you will to repeat it after 3 months, not before. This is because A1C test measures the average of your blood sugar in the last 3 months. If you measure it today, you will have the average glucose level for the last 3 months. So, you will need to check for the next average after 3 months. You can ask for a A1C meter at any local drugstore or by ordering it online. I cannot say any price becausevI am not informed. A1C Result of 6.7% Concern! Please guide me that my daily fasting sugar level always comes less than 105. But after getting A1C my result comes 6.7%. Kindly advice what it means. I was quite satisfied that I was under control. Please also note that I am not taking any medicine. I only use your tips of Natural remedies. What I see from your blood sugar results, I notice that they are fine. Actually, I wanted to congratulate for being determined in beating diabetes naturally. I hope that you will not lose faith and give up! Your fasting glucose readings are less than 105; they are fine. According to the treatment guidelines for 2012 of ADA and EASD; it is recommended that each diabetics should have their individual limits of normal blood sugar level. In other words, in your case, I would say the upper limit for normal fasting blood sugar should be 105 mg/dL. With regards to A1C results; I want to refer again to the ADA/EASD guidelines. Even in this case, the normal A1C level (acceptable) should be according to the patient's characteristics and health status and comorbidities. 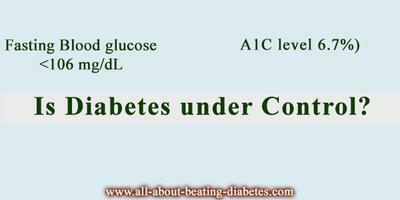 Furthermore, more and more cases of A1C level up to 7 are considered as normal. I think this might be applicable in your case. However, I cannot say it for sure as I do not have more of your personal and health status data. Your doctor (who has them) can give you the most precise answer. Hoping that you will go on beating diabetes through natural remedies.